Free concerts at the courthouse will help Rhea countians celebrate summer beginning June 23 as the Scopes Festival presents Summer Nights. Gospel groups including the Mays Family, Castlens and Shavers, Brad and Beth Harris, and Chris Perdue will open the free series on Saturday, June 23. The concert will begin at 7:30, but activities on the lawn will begin earlier in the afternoon. On June 30, Dayton’s own Abigail Corvin will open for the Brandon Maddox Duo from Nashville. Abigail has earned a reputation as a talented musician in this area, and will provide a local flavor to open the evening. Brandon Maddox has made his reputation blending today’s country with traditional its traditional roots. Rhea County favorites Manshoes headline the July 7 concert. For more than 20 years Manshoes have delighted crowds with their covers of rock standards and their own original works. The Summer Nights series wraps up July 14 with a singer-songwriter event sponsored by Main Stage Music. Main Stage is celebrating its 15th anniversary this year, and singer-songwriter programs have been a significant way for Main Stage to showcase local and regional talent. “We are so grateful that Main Stage has agreed to partner with us to help expand musical opportunities for this area,” Davis said. Following Summer Nights, Scopes Festival will kick off its musical offerings on July 20 with a free concert by The Jug Band and Rhea Springs Revival. 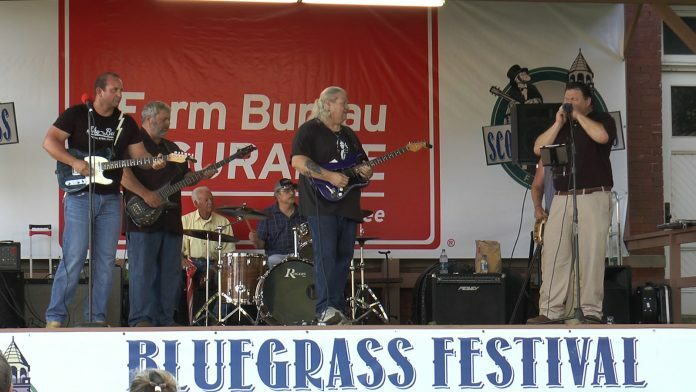 And on July 21, the second annual Scopes Bluegrass Contest will begin on the courthouse lawn at 11 a.m.
For more information about Summer Nights and the Scopes Festival, visit the festival website at scopesfestival.com or scopesbluegrass.com.